Athlete’s Foot is a painful and uncomfortable skin infection. Athlete’s Foot is caused by the Tinea fungus which easily multiplies in warm and moist conditions. The fungal infection can be developed 20when stepping on a moist floor or walking barefoot in a communal gym or locker room. Symptoms of athlete’s foot include discoloured and distorted nails. In most of the cases, athlete’s foot is not dangerous, however it is very stubborn to cure. Due to its amazing properties, garlic is considered one of the best remedies to treat and prevent the athlete’s foot. Is Garlic Useful for Treating Athlete’s Foot? Compound Ajoene present in garlic kills fungus such as Tinea pedis that causes athlete’s Foot. Component Allicin found in garlic has powerful antibiotic properties that speeds up the healing process of infections. Regular consumption of garlic boosts the body’s immune system so that the body can fight off fungal infections more effectively. 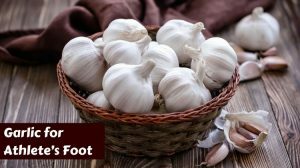 How to Use Garlic for Athlete’s Foot? For your convenience, we have presented the best 10 ways using garlic alone or in combination with other ingredients. Choose one among them and try it regularly. Take 5 to 8 cloves of fresh garlic and crush them to form a smooth paste. Add this paste to a pot of warm water. Immerse your feet in this garlic soak for 20 minutes. Repeat this soak 2 times in a day until the infection clears. Blend 3 to 5 cloves of garlic to a smooth paste. Add a tablespoon of olive oil into it and mix well. Apply this ointment over the infection using a cotton ball. Repeat the application 2 to 3 times a day till the infection heals completely. Pour few drops of garlic essential oil on a clean cotton ball. Using this cotton ball, wipe the affected areas of the feet. Repeat this remedy at least once daily before going to bed. The powerful antimicrobial properties of tea tree oil kill the fungus causing athlete’s foot. It also prevents it from spreading to other parts of the body. Add 30 drops of organic tea tree essential oil and 2 tablespoons of fresh garlic paste to 1 liter of warm water. Soak your feet in this footbath for 10 to 15 minutes. Using a clean towel, dry your feet completely. Repeat it once daily till the infection is healed. Tannic acid present in tea has natural astringent properties that keeps the feet dry and clean. It creates an unfavourable environment for the fungus to survive. Heat a quart of water in a pan. Add 6 to 8 tea bags in the water and let it steep for 10 minutes. Add a tablespoon of garlic powder or garlic paste to the water. Remove the tea bags and soak your feet in it for 30 to 40 minutes. Dry your feet using a towel. Repeat this process at least 2 times in a day. The highly acidic nature of apple cider vinegar kills the fungi causing athlete’s foot. It also reduces foot odour and keeps the affected area dry. Mix equal parts of apple cider vinegar and water in a bowl. Add a tablespoon of freshly crushed garlic into it. Dip a cotton ball into this mixture and apply it over the infected areas of the feet. Hold the cotton ball over the infection for 10 minutes and then discard it. The acids present in lemon juice kills the fungus responsible for athlete’s foot. It also helps to minimize foot odor associated with the infection. Combine 3 tablespoons of freshly squeezed lemon juice, 2 tablespoons of water and 1 tablespoon of fresh garlic juice. Soak a cotton ball in this mixture and use it to wipe your feet thoroughly. Repeat this remedy 1 to 2 times a day until the infection heals completely. The healthy bacteria like acidophilus present in yogurt destroy the fungi causing the infections. It prevents the infection from spreading to other areas. Add a tablespoon of freshly crushed garlic to 2 tablespoons of yogurt. Mix it using a spoon and apply this mixture generously all over the feet and in between the toes. Let the pack dry on its own. Rinse your feet with lukewarm water and dry with a towel. The hormones Gibberellins and Auxin found in pure aloe vera gel boost the natural healing process of infected skin. It also helps to soothe pain, itching and irritation associated with the infection. Add a tablespoon of crushed garlic to it and mix well to form an ointment. Apply this ointment over the infected areas of the feet. Leave it on for 30 minutes and then wash off with cold water. Onion has natural anti-fungal, antibiotic and anti-inflammatory properties that treat athlete’s foot by killing the fungus and reducing inflammation. It also prevents the infection from spreading. Take two medium sized onions and grind them. Strain the juice from the onion pulp and add a tablespoon of garlic juice to it. Dip a cotton ball in the mixture and place it over the infected areas of the feet. Follow this process 2 times a day. Baking soda works as a natural astringent that soaks excess moisture from the feet that prevents fungal infections. It also neutralizes the pH of the skin and prevents foot odor. Take 2 tablespoons of baking soda in a bowl. Add generous amount of garlic juice to it to from a thick paste. Apply this paste all over the feet and let it dry on its own. Wash your feet with water and dry with a towel. Repeat the application once every day for a few weeks. Epsom Salt is a great source of magnesium and sulfate that soothes painful inflammation associated with athlete’s foot. It also helps to flush out the toxins from the body. Add generous amount of Epsom Salt and garlic powder to a footbath. Soak your feet in it for 30 minutes. Follow this procedure 1 to 2 times a day till the infection clears up completely. Some people may be allergic to garlic. Symptoms of garlic allergy include rash or hives, headaches, temperature, etc. So, do a patch test before trying out the treatments. Excessive use of raw garlic can irritate the skin of the feet and cause blisters. The garlic remedies should be continued for some days even after the symptoms have subsided because fungus can stay dormant for days and then recur again. Keep your feet clean and dry at all times to prevent fungus growth. Before applying any medication or natural remedies, scrape away the loose skin from your feet so that the medication can penetrate the infected areas. Sprinkle baking soda or corn starch in your shoes and socks to prevent moisture formation. Wear cotton socks and wash them after every use. Wear sandals for few days until the infection clears. You have to try the process with some patience and consistency for positive results. Do you have any other garlic remedy that works better for treating fungal infections? Have you tried using baking soda to treat athlete’s foot as well? Then please share it with us in the comments section.